Updates (2015-12-17): There are two ways for Apache Spark to access MongoDB data: mongo-hadoop or pymongo-spark. 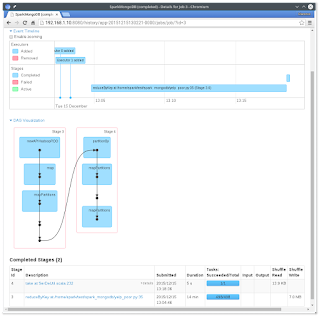 This post is about using mongo-hadoop. There is another post on using pymongo-spark. 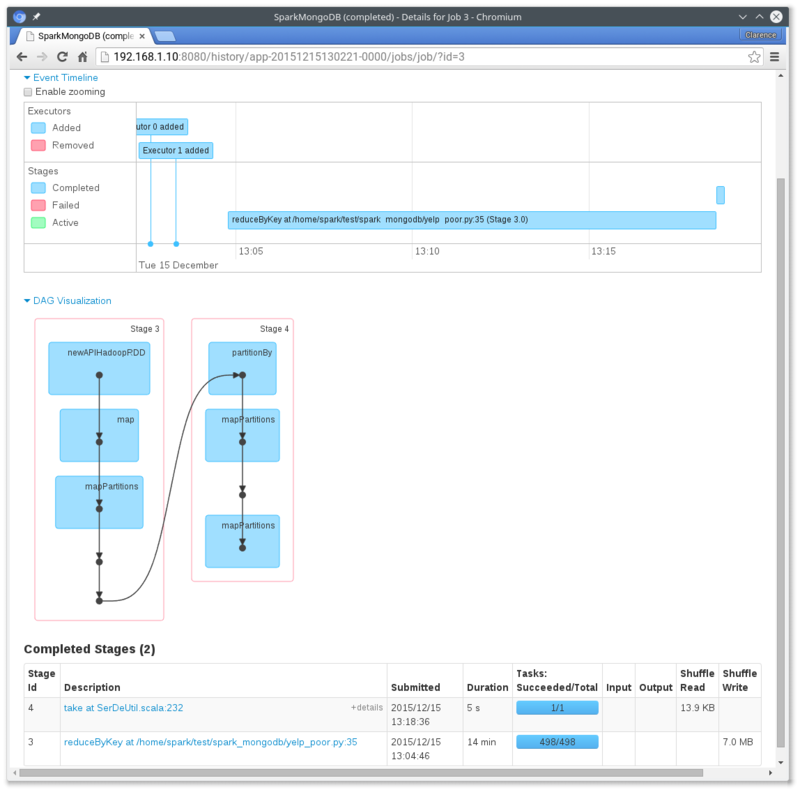 Here is an example of running analytic tasks on Apache Spark using data from MongoDB. Note that this is a trivial problem and it is much more efficient to solve it within MongoDB (or using PostgreSQL FDW). But it is a good exercise to try out the mongo-hadoop solution. 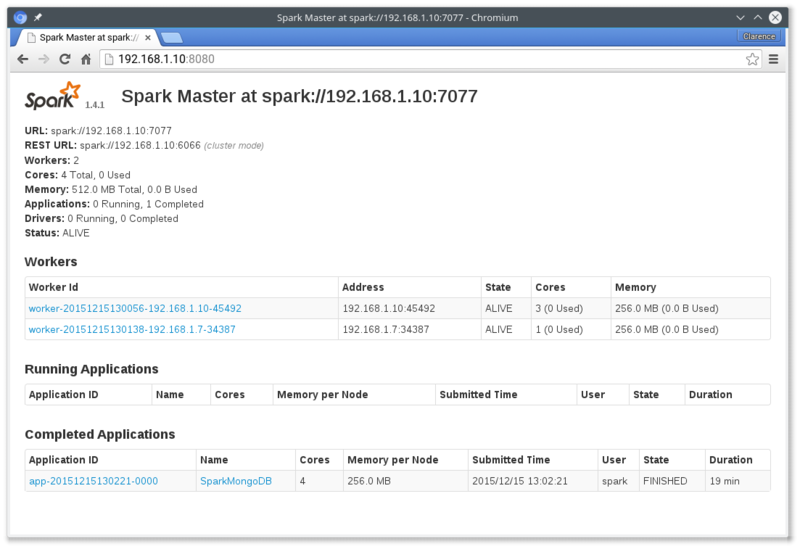 My Apache Spark cluster consists of one UDOO and one Raspberry Pi with UDOO as both master and slave. The CPU and memory resources on these devices are limited. We are going to find, for each business, the number of reviews with rating lower than its rating. I saved them under the lib directory of Spark. It took 20 minutes to complete. Swapping was a big issue due to lack of memory on the ARM devices. Next, will try pymongo-spark to see if skipping the Hadoop layer will improve the performance (however, as of version 0.1, pymongo-spark used mongo-hadoop as the underlying logic). Sir, I have followed all the steps . But got few errors . Sir, could you help me out . I am also using a spark cluster of 3 nodes . 1 master and 2 slaves . But i am using yarn-schedular . I can also show you the errors. @hemanta what was the error? hi hemanta. my suggestion to you is to troubleshoot your spark and mongodb setup separately first. 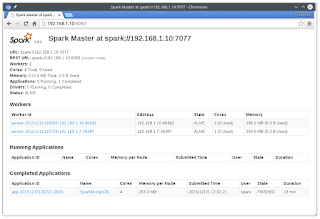 make sure your spark is working fine before adding mongodb to the mix. "py4j.protocol.Py4JJavaError: An error occurred while calling z:org.apache.spark.api.python.PythonRDD.saveAsNewAPIHadoopFile."